Naval Outlying Landing Field Imperial Beach or NOLF Imperial Beach (ICAO: KNRS, FAA LID: NRS) is a United States Navy facility for helicopters, situated on 1,204 acres (5 km2) approximately 14 miles (23 km) south of San Diego and within the city limits of Imperial Beach, California. It is known as "The Helicopter Capital of the World". The mission of NOLF Imperial Beach at the present time as described, is to handle the overflow of helicopter squadrons traffic both VFR and IFR, from North Island. As a result the helicopter squadrons at North Island do 95 percent of their operations at Imperial Beach. In 1917, the United States Army established Aviation Field on the current site of OLF Imperial Beach. Aviation Field was used for air gunnery practices, among other things, by the Army and was kept active throughout World War I. In 1918, it was renamed in honor of Army Major William Roy Ream, the first flying surgeon of the American Army and the first flight surgeon killed in an aircraft accident. In the early 1920s the Navy began using Ream Field for practice carrier landings, but the field was not considered as advantageous for expansion as Brown Field, some 8 miles (13 km) inland, and did not develop much further until later during World War II. In 1943, the present runways were built and construction on the installation’s buildings began, and on 17 July 1943 Naval Auxiliary Air Station Ream Field was commissioned. By 12 April 1946 the station had 78 buildings and four airstrips consisting of runways, one oriented northwest by southeast and the other oriented northeast by southwest, both of which were 2500 by 500 feet (150 m). In addition to the four runways, 82,730 square yards of aircraft parking area were built. Shortly after World War II, Ream Field was decommissioned. In 1951, it was re-commissioned as an Auxiliary Landing Field, and in 1955 was re-designated as Naval Auxiliary Air Station Imperial Beach. In 1951, Ream Field Imperial Beach became home to its first helicopter squadron when HU-1 moved on board. HS-2 and HS-4 were also commissioned here in 1952. They was followed by many others, HS-6 and HS-8 in 1956 and HS-10 was formed in 1960. In 1967, the oldest of the helicopter squadrons, HC-1, commissioned in 1948 at NAS Lakehurst, was divided into five different squadrons, HC-3, HC-5, HC-7, HAL-3 and HC-1 and brought on board at Imperial Beach. On January 1, 1968 NAAS Imperial Beach was raised to the status of a full Naval Air Station and renamed NAS Imperial Beach. The mission of NAS Imperial Beach was to support operations of Naval aviation activities and units. In this capacity it was the home of seven helicopter squadrons, eventually to become the home of ten squadrons, constituting all of the Navy helicopter squadrons on the west coast. The station also supported a Naval Air Maintenance Training Detachment and a Fleet Airborne Electronics Training Unit. At that time NAS Imperial Beach had a total complement of approximately 3400 military personnel. On August 1, 1974, NAS Imperial Beach was once again re-designated as a Naval Auxiliary Landing Field and in October 1975 was designated an Outlying Field (OLF Imperial Beach) and presently operates as a branch of Naval Base Coronado. When Imperial Beach was designated on Outlying Field, this put a halt to a master plan developed on 1967 to determine the facilities required to support units assigned by the Chief of Naval Operations. Under this plan, construction commenced on a new Enlisted Dining Hall and modern Bachelor Enlisted Quarters. In 1968 the control tower and operation building was completed, along with a new Enlisted Men’s Club and a $1.2 million hangar was opened. Other building constructed under the plan were, a new Bachelor Officer Quarters, a second new hangar, and a new Navy Exchange retail store with five times the floor space of the previous Navy Exchange. Along with the halt of construction on base, the helicopter squadrons all were moved to NAS North Island. This meant there was no further need for barracks, meal facilities, aircraft hangars and clubs. These new buildings were closed and everyone associated with them was moved and expected to use the facilities at North Island. In 1977, the empty aircraft hangars were leased to Defense Property Disposal Office (DPDO), now the Defense Reutilization and Marketing Office (DRMO) of the Defense Logistics Agency for storage of excess and salvageable material. In 1978, almost half of the buildings on base, those east of Lexington Street were leased to the Department of Labor. Presently OLF Imperial Beach encompasses 1,204 acres (5 km2) with 270 of those acres leased out for agricultural purposes and 284 acres (1.1 km2) leased to the State of California for a wildlife refuge at the southeast corner by the base itself. ^ La Tourette, Robert, LT USN (June 1968). "The San Diego Naval Complex". United States Naval Institute Proceedings. 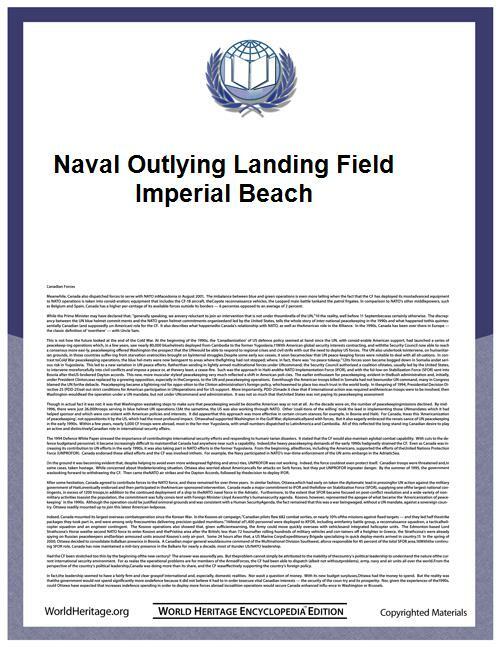 "Background Data: Naval Outlying Field Imperial Beach and Environs".